Amazon, like most stocks in the US market at the moment is struggling. When it comes to stocks like Amazon however, we can expect for the declines to continue for quite some time. Today, we’ll talk about what’s causing the declines as well as why the declines are likely to continue for a while. All in all, Amazon isn’t the only stock in the market that’s struggling at the moment. In fact, the entire US market is struggling. We’ll get into why AMZN is uniquely bad to have in your portfolio at the moment later, but for now, let’s talk about why the market as a whole is having such a hard time. The declines we’re seeing revolve around the Federal Reserve. Currently, the Federal Reserve’s interest rate, known as the Federal Funds rate is at a record low 0.25%. The record low rate currently means that consumers are spending less money on interest, leaving more money available for spending that would benefit corporate earnings and stimulate the economy. The reason the rate is so low at the moment is relatively simple to understand. During the depths of the economic crisis of 2008 and 2009, the Federal Reserve reduced its interest rate in an attempt to stimulate the economy. However, when they did this, they also made it clear that low rates simply couldn’t last forever. When the US economy built to a strong enough point to withstand a rate hike, the Fed would work to start increasing its rate. At the moment, economic conditions in the United States are looking relatively positive. In fact, the US jobs report for the month of October showed that economic conditions in the country are in the midst of a strong rebound. This means that the Federal Reserve is likely to start increasing its interest rate in December. When this happens, consumers will be spending more money on interest and will have less money to spend on products and services, which will turn into struggles for corporations. As a result, investors are balancing their portfolios for the hard times in the market that are soon to come, leading to the declines we’re seeing today. AMZN is a stock with a relatively unique story. At the moment, the company is willing to either take a loss or produce incredibly small profits in order to grow further, leading to big profits in the long run. As a result, the valuation for AMZN is incredibly high. In fact, according to NASDAQ, Amazon is currently trading at a price that’s 367 times what the company is expected to earn through the full year of 2015. This high valuation adds to the risk of owning the stock. So, when bad market activity happens, AMZN is one of the first stocks to fall. Another issue for AMZN is the fact that the company does quite a bit of business outside of the United States. This is where a higher interest rate will create another issue. The simple fact is that when the Federal Funds rate is increased, the value of the USD will head upward. When the value of the USD is high, the cost of goods from American companies becomes higher in other nations. This causes declining demand and weighs heavy on earnings. Historically, after an increase in interest rates, the stock market struggles for a period of several months. 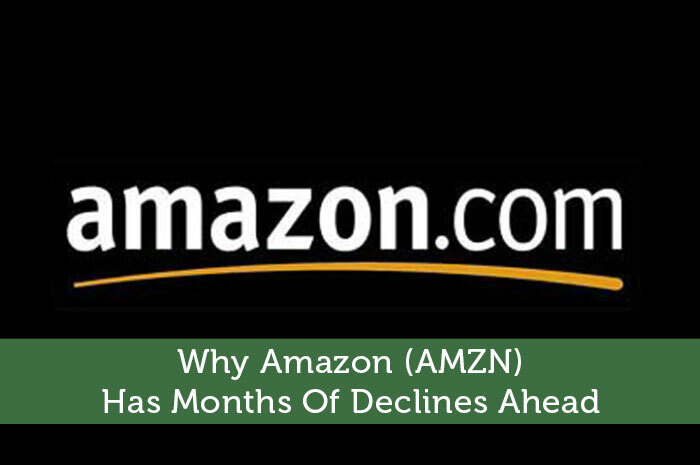 As a result, we can expect for AMZN to continue declining for months. First, we will continue to see slow and steady declines from now to when the rate hike happens. When the rate hike happens, the declines will likely get larger before leveling back to slow and steady losses over a series of months. Where do you think AMZN is headed and why? Let us know your opinion in the comments below! When everyone looks at Amazon, they only see the consumers buying behavior. Amazon has a huge Web Services business which brings in a ton of revenue. While agree, that there is a short term dip all stocks will go through when interest rates go up, Amazon has a lot of room to grow in the coming years. Yeah, only up 75 bucks this month. Struggling. On what planet is AMZN a declining stock? The one where you can only remember the past 72 hours? the entire thesis is that the company can raise prices any time it wants to generate profits. Brick and mortar stores are reducing prices because of competition. This will hurt their margins. The company also is growing AWS, but if you look at SEC reports you will see when they discuss margins they exclude stock compensation. If stock compensation taken into account, the margins are quite small, approaching 5%. A good part of their cash flow comes from increased shares from the employee options and getting float on account payables that are due later than account receivables. If growth slows, their cash flow will take a hit. They spend money like crazy to grow the business. When growth slows when company grows to a certain level, they will be in trouble. This is a momentum stock. Momentum is great when going up, and ugly when it eventually will likely collapse. Amazon has been scaring me lately. There’s no feasible reason for the price to be this high now. I’m loving the fact that everyone is being so irrational, so as soon as it gives some seriously bearish signals, I’m shorting the HECK out of it. I bought in at $288, so I’m loving it, but I never thought it would get this high. You can play the stock short term by shorting if you know what you are doing. Amazon’s Web Services powers the cloud and they have the largest public cloud infrastructure that power’s so many businesses and is growing at a record rate. Long term, I can see Amazon being a $1000 stock. Right now, it is at high and I can see it going through some correction. However, I don’t see it going through months of decline.